Introducing the new Z2iR™ Module by Card Access. This module was designed specifically to integrate with Control4® systems and gives Control4 dealers additional IR (infrared) outputs to control any residential device with a Control4® driver – without ‘home running’ wires back to a Home Controller. One Z2iR controls up to 4 IR-enabled devices including: TVs, projectors, streaming media devices, set-top boxes, window coverings, and more. Remember the good ole’ days in which many homes were equipped with centralized music systems that pumped tunes into each room? The only problem was that such systems came with complex wiring systems and expensive built-in wall consoles, which were quite costly to maintain and nearly impossible to fix if broken. 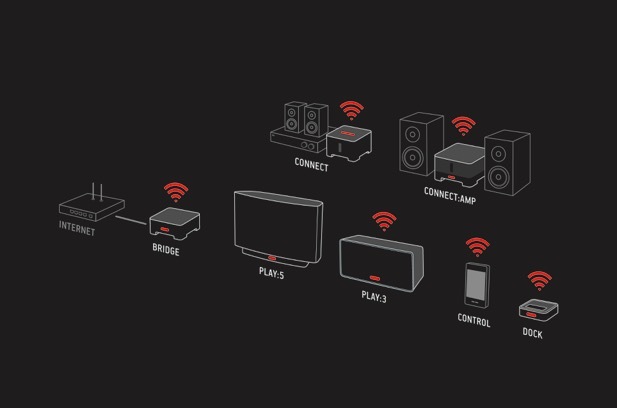 Thanks to the digital age, technologies like Sonos have made it easy listen to music at home! Now music can be customized per room and controlled wirelessly via your MAC/PC, iPad, iPhone/iPod, or Android. Plus, your music listening options are unlimited as you can access it from Sirius, RDIO, Slacker, iTunes, Window media files, Wolfgang, and other sources.